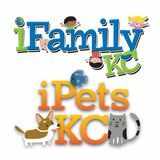 Visit www.iFamilyKC.com for coupons, freebies & opportunities to “Enter To Win”! Call 913-744-1400 for advertising information! Call Call 913-744-1400 913-744-1400 for for advertising advertising information! information! Brookridge Day School 913-649-2228 www.BrookridgeDaySchool.com 9555 Hadley, Overland Park, KS 66212 Ages 2 ½ thru 3rd grade May 28th – July 31st We enjoy pool trips, science experiments, fun field trips, sprinkler parties, our “Summer Smarts” academic program and more! Have the best summer here at Brookridge! Code Ninjas See our ad on Pg. 18 3622 W. 135th St. Leawood, KS 66224 913-444-9448 www.CodeNinjas.com Ages 7-14 Transform your child’s love for technology and video games into a new skill! Code Ninjas Camps: Minecraft, Robotics, Drones, Roblox, Website, App and Game Building! Engineering For Kids 913-523-5171 www.engineeringforkids.com/southkc Ages 5-13 SouthKC@Engineeringforkids.net Engineering For Kids brings science, technology, engineering and math to life in a fun and hands-on way. Offering summer camps for kids ages 5-13. Heart of America Shakespeare Festival 816-531-7728 www.KCShakes.org 3732 Main St. KCMO 64111 Ages 5-18 June thru August 2019 Camp Shakespeare is a fun summer arts experience for kids! Students improve understanding of literature and Renaissance times while creating their own version of a Shakespearean classic. Mattie Rhodes Center 915 W. 17th St. KCMO 64119 816-221-2349 • www.MattieRhodes.org Ages 2-18 • June – August 2019 We offer Art Camps for all ages! Itty Bitty Art Camp: June 4-7, June 11-14, Teen Art Camp: June 18-21, Summer Art Camp 4 Sessions: June 25-28, July 9-12, 23-26, July 30-Aug 2, and more! Check out our web site for latest scoop. Paint, Glaze & Fire Ceramics & Coffee House See our ad on this page 12683 Metcalf, Overland Park, KS www.PaintGlazeandFire.net 913-645-1966 info@paintglazeandfire.net Ages 6-16 • June – July Camp ARTrageous Summer Camp has never been so much fun! No 2 camps are alike all summer long. Morning and afternoon sessions available on select Tuesdays, Wednesdays and Thursdays. Book ONLINE starting February 10th! Play-Well TEKnologies LEGO®-Inspired Engineering Camps Various locations in the Kansas City area including Overland Park, Lawrence, Blue Springs, Independence, Gardner, Lee’s Summit, Lenexa and Shawnee. 816-516-1161 • www.play-well.org Ages 5-12 • June 3rd – August 9th Dream it, build it, wreck it, repeat in our LEGO-inspired STEM camps! Engineer interesting projects, engage in critical thinking, work collaboratively and learn through play! Sky Zone Lee’s Summit & Kansas City See our ad on Pg. 15 2801 NE McBaine Dr., Lee’s Summit, MO 64064 6495 Quivira Rd., Shawnee KS 66216 816-457-0068 x 2000 SkyZone.com/KansasCity SkyZone.com/LeesSummit Ages 5-14 • Spring, Summer & Winter Break – all holidays. Bounce off the walls during Spring & Summer Break at Sky Zone! Ninja Warrior, trampolines & more. Lunch included! Full and half day options available. Sibling discounts available too. Learn more at our web site links above. Taste Buds Kitchen See our ad on Pg. 22 5336 W. 151st, Leawood, KS 66224 913-257-5667 www.TasteBudsKitchen.com/Leawood Leawood@tastebudskitchen.com Ages 4-13 • May 28 thru August 9th A new and unique menu is offered each week. Register for multiple weeks or join us for a single day. We provide a hands-on cooking experience for every budding chef! Theatre of the Imagination 6100 W. 127th St., OPKS 66209 816-561-2787 • DramaKC.com Ages K-8th • May 28-August 9 Act! Sing! Dance! Make Movies! One and Two week camps. Free costumes & shows. Space Warriors, Unicorns, Fidget Spinners & Frozen Princesses! 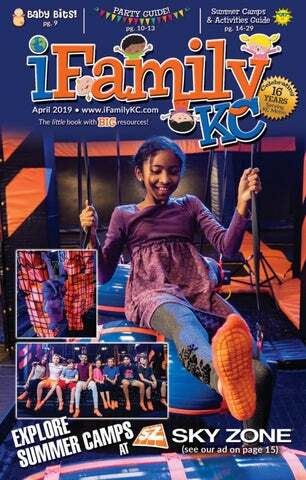 Mention iFamilyKC for $10 OFF! The Nelson-Atkins Museum of Art 4525 Oak St. KCMO 64114 816-751-1278 Nelson-Atkins.org/SummerClasses Ages 3 – adult • June – August Make it a summer of imagination and fantasy at The Nelson-Atkins. Classes, full-day camps and one-time workshops available! YMCA of Greater Kansas City See our ad on Pg. 24 913-345-9622 • KansasCityYMCA.org/camp Ages 5-12 • May 28th – August 9th Best Summer EverTM. Y Summer Day Camps are full of learning, adventure and friendship! Blue Valley, Olathe, Platte County, North KC, Shawnee Mission and Spring Hill District locations. Our Annual iFamilyKC Summer Camps & Activities Guide runs in print and online through July! Get your Display Ad, TEXT Listing or BOTH in now! Call 913-744-1400 or email info@iFamilyKC.com Call 913-744-1400 for advertising information! 402-968-1029 Catherine.koth@mickeyvacations.com www.Facebook.com/mickeyvacationsbyCatherine Free vacation planning for Disney World, Disneyland, Disney Cruises, Adventures by Disney, Universal Studios & Sea World! Email today for a free quote! 732-337-7630 Jane.Montedoro@gmail.com â&#x20AC;˘ jmontedoro.myrandf.com Treat your skin to Rodan + Fields and say goodbye to wrinkles, dry skin, acne and more. Contact me today about our current deals. 816-309-3348 â&#x20AC;˘ Mary@selfsafetymary.com www.mydamselpro.net/selfsafetymary Awesome safety stocking stuffers. Pepper Spray, Kubatons, Keychain alarms from $10-$15! Auto safety, childrens books, stun guns & more. 816-392-4791 taylor8599@hotmail.com https://w6310.myubam.com Highly engaging, interactive books for kids of all ages. Contact me for personal recommendations that will help you family grow in their love of reading! Call 913-744-1400 for advertising information! APRIL ISSUE is online AND on the streets! It's FULL of summer camps, party resources, family wellness providers, COUPONS and more!